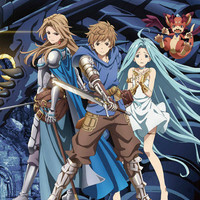 This weekend, hit mobile RPG Granblue Fantasy gets its animated adaptation with a special from A-1 Pictures and director Yuuki Itoh. Aniplus Asia, from Southeast Asia (Singapore, Indonesia, the Philippines and Thailand) has offered a subtitled look ahead of its January 21st debut. This is a world of the skies, where many islands drift in the sky. A boy named Gran and a talking winged lizard named Vyrn lived in Zinkenstill, an island which yields mysteries. One day, they come across a girl named Lyria. Lyria had escaped from the Erste Empire, a military government that is trying to rule over this world using powerful military prowess. In order to escape from the Empire, Gran and Lyria head out into the vast skies, holding the letter Gran'sfather left behind - which said, "I will be waiting at Estalucia, Island of Stars". FEATURE: Found in Translation - Who is the God in "Saga of Tanya the Evil"?